If someone you love is struggling with the disease of addiction, an intervention may be warranted. An intervention will help that individual see their problem, the way it affects the people they love and the treatment options that exist. If you are planning to stage an intervention, here are four things you must do. Having someone you love struggle with addiction is a highly emotional event. Before you approach an intervention, you must be certain that your own emotional state is where it should be, so you can help the person who is dealing with addiction. First, make sure your approach is one of love and concern. If you feel resentment or anger towards the individual, the situation could turn quite volatile. When you come to the intervention, keep your love and concern at the forefront of your mind, as this will prevent you from responding out of frustration and anger. The time and place of the intervention are crucial to ensuring that it goes well. First, choose a time when the individual is the least likely to be drunk or under the control of drugs. The day after a binge can be quite effective, as the individual will be suffering the after-effects but will have a clear head. Next, arrange the intervention at a place where the individual feels safe. Often the family home is a good choice if the individual is a minor, but not for adults, as an adult can ask everyone to leave. Choose a non-threatening, comfortable environment. What will you do if the individual refuses professional help or claims he or she can handle the problem independently? Have answers to common questions, so you can insist that help is gotten now, not weeks from now. Delaying help means not getting help. Have a contingency plan in place for these common objections. Part of your contingency plan should include consequences or boundaries you will put in place if help is refused, as Mayo Clinic recommends. Addiction affects everyone who cares about the individual, and you need to make it clear that you will have to set up some boundaries if the behavior continues. These boundaries may include limited contact with you or your children, taking away the individual’s right to drive or asking a loved one to move out. While this may feel harsh, sometimes consequences like these are what an individual needs to finally accept help for addiction. Once you have gotten the individual to the intervention site, have each member of the intervention team, which should consist of those who love and care for the individual, take turns sharing their concerns. Once all of the concerns have been expressed, present a treatment option that you have already researched and prepared. Be prepared to take the individual directly to treatment if you can get a positive response. 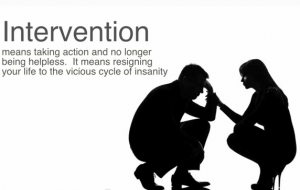 Staging an intervention is not a simple task, but it is a necessary one. If you do it well, you just might be able to convince your loved one that help is needed. The end result, someone who has recovered from the disease of addiction, is worth the effort it takes to stage a well-planned intervention. Talk to a recovery specialist about other intervention tips to consider as you stage an intervention for your loved one.